Free Wi-Fi and parking plus a downtown location within walking distance of Whitefish's restaurants shops and bars make the Downtowner Motel Whitefish an affordable and convenient stay during your visit to Whitefish Mountain Ski resort or Glacier National Park. The three-story Downtowner Motel offers 21 rooms with cable TVs and free Wi-Fi so you can check the snow report or email from your room. Rooms with microwaves and refrigerators are available. Non-smoking rooms may be requested. After a day of hiking or skiing soothe your sore muscles in the hot tub. The hotel has a fitness room and a lending library to keep you occupied during down time. The on-site restaurant serves lunch dinner and portable meals to go. Save time and ensure first tracks by purchasing your lift tickets at the hotel. Fax and copy services are available. Parking is free. Pets are welcome. 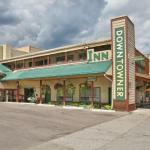 The Downtowner Motel is in the heart of Whitefish one block from the shopping dining and bar scene on Central Avenue. Catch the Snow Bus two blocks from the hotel and let it whisk you up to Whitefish Mountain Ski Resort five miles away. The picturesque greens at Whitefish Lake Golf Course one mile away are groomed for cross-country skiing in the winter. Whitefish City Beach one mile away is an fun place to enjoy a summertime splash. The hotel is 30 minutes from the spectacular jagged peaks of Glacier National Park often referred to as "the crown of the continent." The hotel is two blocks from the Amtrak station served by the Empire Builder route. Glacier Park International Airport is 12 miles away.